Supertrucks designed the latest addition to its market-leading range of vehicle racking in response to the rapid growth in popularity of bigger, heavier products, such as bi-fold doors and windows, and orangeries. 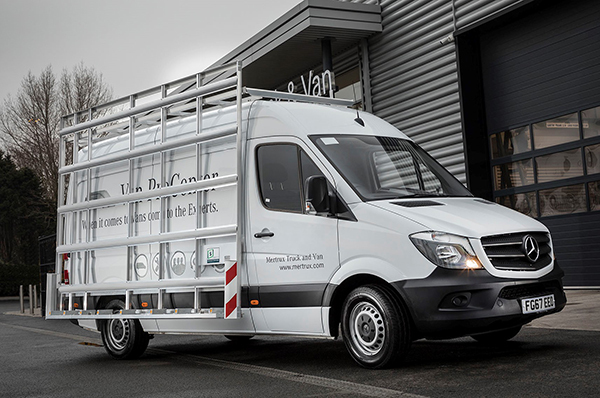 The St Helen's-based specialist has fitted the first example of its new rack to a Mercedes-Benz Sprinter van supplied by East Midlands Dealer Mertrux Truck & Van, with which its parent company, the multi-faceted Bevan Group, enjoys a close relationship. Mertrux is now offering this vehicle for trial by prospective customers. Fabricated from lightweight aluminium, Supertrucks' Multi-Purpose Rack is secured to the exterior of the vehicle without the need to drill the sidewall. This is an important factor in helping to ensure that any paint or bodywork warranty provided by the manufacturer remains valid, and that the resale value of the vehicle is protected. Instead, the new frails are fixed at the top to a roof rack, and at the bottom, depending on the base vehicle, either by making use of pre-existing holes or by drilling one or two new ones on the underside, where they cannot be seen. An easily-used strap securing system and second-stage trim carrier. Supertrucks has various fitting locations throughout the UK and Europe, and also offers a collect, fit, and return service at weekends. Bevan Group Engineering & Production Director Ian Roberts says: "The window industry has witnessed massive change over the last couple of years. There is a lot more architectural work, with bi-folds and orangeries becoming more affordable and popular. "The upshot is that products are getting bigger, heavier and more difficult to transport. Our Multi-Purpose Rack addresses this issue head on, by enabling customers safely and securely to transport larger products than was previously possible on a standard van." Andrew Kerrane, Group Van Sales Manager at Mertrux Truck & Van, adds: "Supertrucks parent the Bevan Group is now well established as our preferred partner for a variety of body types. Its product quality and service levels are second to none, and the relationship between our two businesses goes from strength to strength. "We already supply Mercedes-Benz vehicles to a number of customers which operate within the glass and associated industries, and are aware of several others for whom Supertrucks' new rack is likely to offer significant advantages. We were therefore delighted to provide a Sprinter van for demonstration purposes."